As WW1 began in August 1914, military aviation was still in its infancy. Headquarters in all the European countries that had commenced warfare were very skeptical as to possibility of military use for aircraft. In the beginning, the chief and actually only application of aviation was to be short-range frontline reconnaissance as well as observation and guidance of artillery fire. The Reich’s high command was rather quick to understand the significance of air reconnaissance. This was possible owing to the successes achieved before the war by air ships designed on Lake Boden at Graf Ferdinand von Zeppelin’s company. The air ships of his design had taken part in imperial military operations, where they proved useful for observation of army moves. Since then, the Germans had been paying greater attention to air reconnaissance pursued by devices heavier than air. The aircraft assigned to carious armies and corps contributed to a certain degree to initial German successes on the western front. The imperial air service was organized into units of six aircraft named Feldflieger-Abteilungen, contracted to FFA (field air units). Each was assigned to one army or corps, under which it served. However, despite the initial successes of the air service, the High Command was not interested in further development of the new kind of weapon. Basic technical personnel was lacking, fuel and spare parts deliveries were bad, aircraft crews were not assigned ground personnel teams. This resulted in the German air service having lost about 100 of the 232 aircraft it possessed and 52 airmen dead by October 1914. On October 5, 1914 there appeared one more, so far unnoticed, threat. A French Voisin LA flown by Sergent Joseph Frantz attacked a German reconnaissance Aviatik B biplane. The French craft was armed with an 8 mm Hotchkiss machine gun operated by the onboard mechanic, Sapeur Louis Quénnault. Although the gun jammed after several shots, it was not before one bullet killed the pilot, the German aircraft falling to the ground. This forced German pilots to take shooting weapons into the air for self-defense from French attacks. As German aircraft were driven by tractor propellers, in contrast with many British or French constructions, which were the pusher type, they could not have forward-shooting machine guns installed on them. This problem was first approached by the French. In the spring of 1915 aircraft engineer Raymond Saulnier and pilot Roland Garros installed a machine gun which fired through the propeller area on top of the front fuselage of a Morane L. Where the propeller was exposed to machine gun bullet hits, its blades were narrowed down and additionally received armor in the form of steel wedges. On April 1, 1915 so equipped a Morane L piloted by Garros shot down a German reconnaissance Albatros, thus beginning the history of fighter aircraft. On April 19, 1915 Garros’ Morane landed on German-occupied territory following an engine trouble, and then the secret was revealed. The Germans very quickly devised a better mechanism, called synchronizing gear and enabling machine guns to be fired through the propeller without danger of damage. Patented by Fokker, the synchronizer was the breakthrough invention which gave rise to the German fighter air force. It was installed on the Fokker E.I monoplane, and later in its subsequent versions: E.II, E.III and E.IV, armed with a Spandau 08/15 cal. 7.92mm machine gun. These machines gave the Germans unquestionable advantage in the air – it was the beginning of a period which the Allies called the “Fokker Scourge”. 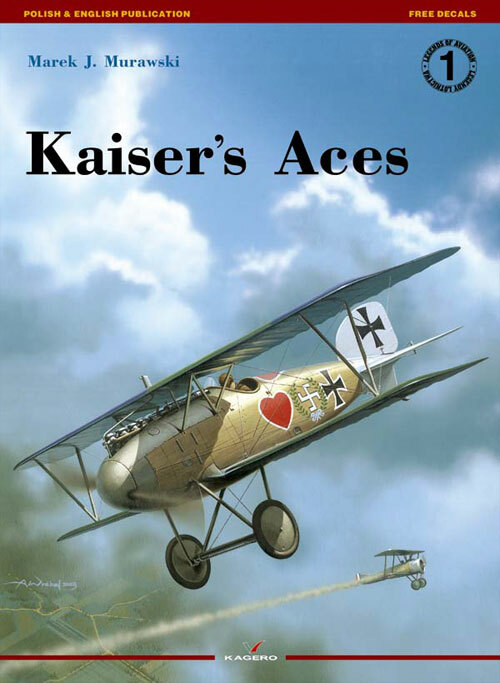 The first Fokker pilot to shot down an Allied aircraft was Kurt Wintgens. He was born on August 1, 1894 in Neustadt, Bavaria. With the outbreak of war he entered the air service as an observer. In February 1915 he underwent pilot training. After the course, he was sent to the Fokker factory to become familiar with the new, light, single-seat reconnaissance aircraft, the E.I, which was then still not equipped with a machine gun. In the summer, these aircraft were armed, and the machine with a serial number E 2/15 was assigned, along with Wintgens, to the Bavarian Feldflieger-Abteilung 6b, stationed at Bühl. Patrolling east of Luneville on July 1, 1915 about 18.00, Wintgens noticed a reconnaissance Morane-Saulnier Parasol flying nearby at 2,000 m. The French pilot noticed the enemy and dived. After a few failed attempts to outmaneuver the Fokker, the Morane turned for the Allied lines, trying to escape. Wintgens managed to approach the enemy and fired a four-second burst at close range. The French machine plunged down to crash behind the Allied lines. It was the first ever aerial victory to be scored by a German fighter pilot. However, since the Allied machine had fallen behind the frontline, it was not credited by the German military authorities. On July 4 Wintgens scored his second aerial victory, shooting down another Morane. This kill was not credited, either. On July 15, 1915 he managed to defeat a third Morane in combat. This time the shot-down aircraft fell to the ground in the Schlucht area on the German side of the front. It was the first officially confirmed aerial victory to be scored by a German fighter pilot. Kurt Wintgens raised his total to nineteen confirmed victories over the next year. After the eight one, achieved on June 30, 1916, he was awarded the highest German decoration “Pour le Mérite” on July 1, 1916. He died on September 25, 1916 while escorting a two-seat reconnaissance machine from FFA 23, which was attacked by French fighters. Wintgens saved his escortee2 but was himself fell to Alfred Maria Joseph Heurtaux (21 aerial victories) of France’s SPA 3 fighter squadron. However, the title of the first German fighter ace belongs to Max Immelmann. Max Franz Immelmann was born in Dresden on September 21, 1890. Having graduated from high school, Max went to the Dresden school of cadets in 1905. After maturity examinations and graduation, he was directed to Eisenbahnregiment 2 (2nd railway regiment), stationed at Berlin-Schöneberg. In April 1912 he left the army to undertake studies at the Dresden technical university. When the war broke out, he was drafted and assigned to the 2nd railway regiment, with which he had served during the time of peace. The rear positions did not suit Immelmann – he applied to join the air service. On November 12, 1912 he found himself in Flieger-Ersatz-Abteilung 2 (2nd auxiliary air unit) at Adlershof. He received his pilot’s badge on February 9, 1915, while on April 25 he was directed to Feldflieger-Abteilung 62 under command of Hptm. Hermann Kastner. 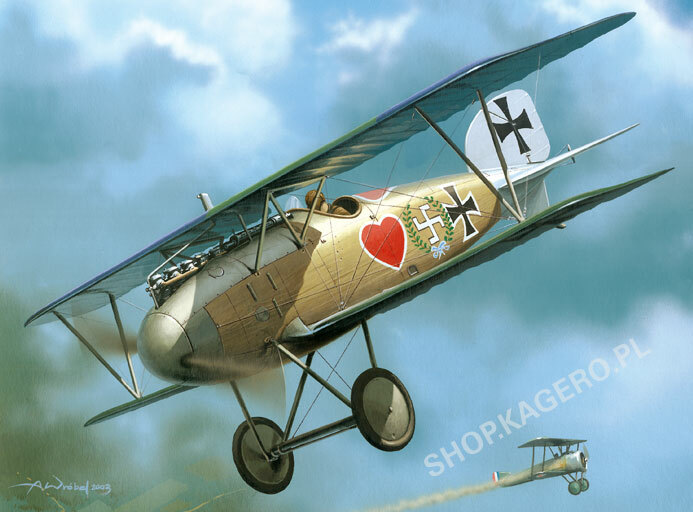 Immelmann flew his first sortie as the pilot of an unarmed reconnaissance LVG B on May 16, 1915. On June 3 his courage in the face of an enemy was recognized, winning him the Iron Cross Second Class. When first two single-seat Fokker E.I monoplanes were delivered to FFA 62 at the end of June 1915, they were assigned to two distinguished pilots of the unit: Max Immelmann and Oswald Boelcke. On July 14, 1915 Immelmann was promoted to the first officer rank – the Leutnant. On August 1, 1915, while the British were raiding Douai airfield, Immelmann attacked a BE 2c (ser. no. 2003) of 2 Sqn RFC, damaging it and forcing to land near Brebiéres. It was his first aerial victory. During the next few months Immelmann was the only Fokker pilot to participate in the aerial defense of Lille. On October 25, 1915 he scored his fifth, confirmed, victory (the other four aircraft he had shot down had fallen behind enemy lines and had not been officially credited). His activeness in the air earned him the nickname of the “Eagle of Lille” (Adler von Lille), which was also used by his adversaries. On January 12, 1916 he was awarded the Pour le Mérite. By the end of March his tally of confirmed kills had risen to fourteen. Max Immelmann became Germany’s first pilot – a national hero. The member states of the German Reich gave him the highest military decorations, whereas postcards with his image were to be found in every bookstore and newsagent’s shop. On the morning of June 18, 1916 Max Immelmann scored his fifteenth confirmed kill. On the afternoon of that day he took part in an aerial engagement between four Fokkers and seven British F.E. 2bs of 25 Sqn RFC. The German ace attacked the rearmost British machine. Immelmann the British gunner, Corporal J. H. Waller, opened fire simultaneously. A moment later, one of Immelmann’s bullets cracked a propeller blade following a synchronizer failure. The engine fell vibrating, the vibration passing on to the fuselage framework. Soon, the tail and then the wings broke off. The front fuselage and the cockpit got smashed into the ground, killing one of the most famous German fighter pilots. Immelmann’s successor was Max von Mulzer, born on July 9, 1893 in Kimratshofen, Bavaria. He was the son of a doctor and intended to go in his father’s footsteps. However, after the war broke out, he was drafted and sent to the 8th Cavalry Regiment as an NCO. In September 1914 he was decorated with the Iron Cross for a daring escapade deep into an enemy for­mation. In December he was promoted to ­Leutnant. Next year he applied to join the air service. He completed a pilot course in December 1915. On July 1, 1916 he assumed command of Feldflieger-Abteilung 32. As soon as July 8, 1916 he was a scorer of eight aerial victories, which earned him the Pour le Mérite, awarded a week later. He became a national hero in his home of Bavaria, receiving the highest Bavarian decoration, the order of Max Josef, whereas the Bavarian king gave him the title of Max Ritter von Mulzer.3 He was not only popular in his homeland – the girls of the occupied France called him “Le Joli Boche”. In September 1916, on scoring his tenth victory, von Mulzer, called the “Second Eagle of Lille”, was posted to the Bavarian Flugpark 6 (6th Air Park), stationed at Valenciennes, where the new Albatros D.I fighter was being tested. On September 26, the upper wing of the fighter he was piloting broke off soon after take-off. Prior to his last flight, von Mulzer spoke to the people who surrounded him: ‘Immelmann is dead, Parschau is dead, Wintgens is dead – now it’s my turn”. Another Fokker monoplane pilot who became famous in 1915 was Leutnant Wilhelm Frankl. Frankl was born on December 20, 1893 in Hamburg into the family of a Jewish merchant. Graduating from high school in Frankfurt-am-Main, he commenced studies in Berlin, where he became interested in aviation. On August 20, 1913 he received pilot’s certificate no. 490. Drafted in August 1914, he began service with Feldflieger-Abteilung 40 in Flanders under Hptm. Adolf Victor von Koerber. On May 19, 1915 he and his observer shot down a French Voisin with their infantry rifles! His first victory on a single-seat Fokker came on January 10, 1916 when he downed a French Voisin biplane armed with a 40 mm cannon. Nine days later he shoots down another machine of that type, and a third one on February 1. Having scored his ninth victory on August 12, 1916, he becomes the first and sole German pilot of Jewish descent to be awarded the Pour le Mérite. On the Friday of April 6, 1917 at 02.30 a.m. commander of Jasta 4, Lt. Frankl, shoots down a British F.E. 2b (ser. no. 7714, crew: 2nd Lt. A. R. M. Richards and 2nd AM E. W. Barnes) of 100 Sqn RFC near Quiery le Motte. The victim was making a night raid on German positions. It was the first night aerial victory for the German fighter air force. Six hours later Lt. Frankl takes off on another mission. When over Arras, Jasta 4, which he was leading, met a formation of British reconnaissance aircraft – F.E. 2bs of 11 Sqn RFC escorted by F.E. 2s from 25 Sqn RFC. The Albatroses attack immediately. Frankl opens fire on one British machine, first hitting the engine, and then killing the gunner. The British pilot manages to force-land near Feuchy. A moment later another F.E. 2 falls down. At 09.30 Frankl was airborne again, this time to intercept a reconnaissance B.E. 2c (ser. no. 2879) from 8 Sqn RFC. After 25 minutes’ chase the British aircraft falls to the ground north-east of Boiry. The crew – Lt. G. J. Hatch and Cpl. E. Landridge – do not survive. It is the fourth victory scored on this day by Lt. Frankl. On April 7, 1916 at 19.10 south-east of Fampaux Frankl forced a landing of a Nieuport (A6773) piloted by commander of Flight C of 60 Sqn RFC, Capt. N. B. Knowles. The British pilot was taken prisoner. It was Lt. Frankl’s twentieth and last victory – next day, the Easter Sunday of the year 1916 at 14.15, his Albatros D.III (2158/16) was hit by return fire from Bristol F2A fighters’ gunners of 48 Sqn RFC and fell, burning, near Vitry/Sailly. Lt. Wilhelm Frankl was buried with due military honors at the Berlin-Charlottenburg cemetery. In the thirties, after the Nazi party gained power, Frankl’s name disappeared from the official lists of Pour le Mérite holders because of his Jewish nationality. Only forty years later, in 1973, when the Bundesluftwaffe’s JG 74 was named in his honor, was Frankl restored to the pantheon of German fighter aces. Fokker monoplanes were closely associated with the name of Otto Parschau, who was the first to present the new aircraft to frontline pilots. Parschau was born on November 11, 1890 in his father’s Klutznick manor in the Ortelsburg (Szczytno) region in East Prussia. A high-school graduate, he began military service on May 30, 1910 as a Fahnenjunker (cadet) with Infanterieregiment Nr. 151 (151st Infantry Regiment). Graduating from officer school in Hanover a year later, he was promoted to Leutnant.